Although the modern city of Bhubaneswar was formally established only in 1948, the history of the areas in and around the present-day city can be traced to 3rd century BC and earlier. It is a confluence of Hindu, Buddhist and Jain heritage boasting of some of the finest Kalingan temples. With many 6th -13th century Hindu temples, which span the entire spectrum of Kalinga architecture, Bhubaneswar is often referred to as a "Temple City of India". We were on a 5-day holiday to Odisha. 2 days would be spent with Bhubaneshwar as the base and the remaining 3 with Cuttack as the base. Travelling with me was my wife Vrunda and another couple - Ujwal and his wife Jaya. As you must have read from my many travel blogs, this couple usually gives us great company. We landed in Bhubaneshwar early afternoon on a direct flight from Mumbai. We had booked a car which would remain with us for the entire length of the tour. Our driver, Sushanto, picked us up from the airport. He would double-up as our guide. From the airport we drove straight to Udayagiri & Khandagiri. 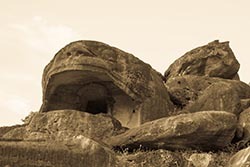 Udayagiri & Khandagiri Caves are one of the earliest groups of Jain rock-cut shelters. 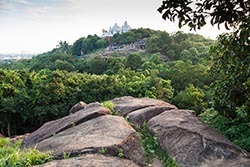 The caves of Udayagiri (Hill of Sunrise) and Khandagiri (Broken Hills) command a unique position in history, rock-cut architecture, art and religion. 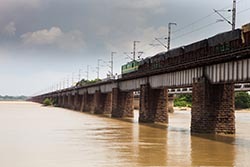 The two hills rise abruptly from the coastal plain, about six km west of Bhubaneswar. Called lena, in the inscriptions, the caves of Udayagiri and Khandagiri are essentially dwelling retreats or cells of the Jain ascetics, opening directly into the verandah or the open space in front. 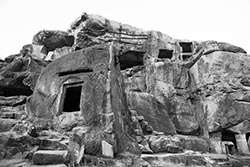 Mostly excavated near the top of the ledge or boulder, they simply provided dry shelter for meditation and prayer, with very little amenities even for small comforts. The height being too low, does not allow a man to stand erect. Each cell was tenanted by several monks. The cells are austerely plain, but their facades are encrusted with sculptures depicting auspicious objects worshipped by Jains, court scenes, royal processions, hunting expeditions and scenes of daily life. The austere later additions, when Jainism no longer enjoyed royal patronage in this part, show 24 Jain tirthankars. At present, all the important caves have been numbered to avoid confusion in nomenclature. We visted all the caves, namely Choto Hathi, Alkapuri, Jay Vijay, Manchapuri, Swargapuri, Ganesha and Tiger. Just opposite Udayagiri are the Khandagiri Caves that are carved on top of the hill. Since it called for a climb, and we being tired from the journey, decided to give the caves a miss and headed to our hotel. The main reason being the heat and the humidity at the time of our visit. Every time we got of the car, we imagined the comforts of a hotel room! Actually, had I been alone I would have not missed any of the sites. But when you are with your family, a few limitations can come up. So be it. For the 2 days in Bhubaneshwar, we were booked at Hotel Trident - a fine property with excellent rooms and hospitality. The next morning after breakfast, we drove towards Lalitgiri about 90 kms from Bhubaneshwar. Enroute we took a few photo stops of beautiful landscapes of rice fields. The earliest Buddhist Complex dating back to the 1st century AD, Lalitgiri forms an important node of the Diamond Triangle - Lalitgiri - Ratnagiri - Udayagiri. Well connected by excellent roads to Cuttack and Bhubaneswar, recent excavations here have brought to light significant archaeological material that upholds Lalitgiri as a great centre of Buddhist attraction. The majestic ruins of the huge brick monastery, the remains of the chaitya hall, a number of votive stupas and a renovated stone stupa at the apex of a small rugged sandstone hill dominate the rural greenery around. We headed back to the city. The rest of the day was spent shopping. Odisha is known for its Ikat Sarees. The next morning we would leave for Puri. 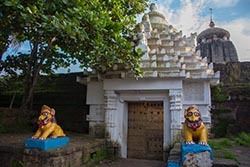 But before hitting the road we would visit two landmarks - one modern and the other ancient - namely Nandankanan Zoo and The Lingaraja Temple in Cuttack. Bhubaneshwar and Cuttack are like twin cities. The zoo is enriched with 210 enclosures. It has the significance of having both the cages and open moat enclosures. Nandankanan is the only zoo in India with the credit of having Patas monkey, Eastern Rosella and Open-billed Stork. 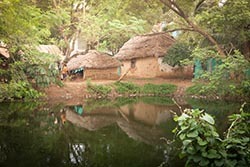 Besides, it has the glory among the 2 zoos in India having Orang-Utan, Indian Pangolin, Spotted Munia and Burmese Python. It is also among the three zoos of India having Green-winged Macaws and Cinereous Vulture. It is the host zoo for white tigers. White tigers were born to normal coloured parents in 1980, a unique event in the world. 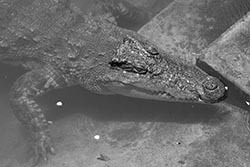 As also the first zoo in the country where endangered Gharials were born in captivity in 1980. The zoo also offers an interesting white-tiger safari. We hired the private services of an electric cart. Visitors have the options of hopping in with other visitors. After having spent a good 90 minutes in the zoo, we headed to the Lingaraj Temple. The Lingaraja temple is the largest temple in Bhubaneswar. The central tower of the temple is 180 ft tall. 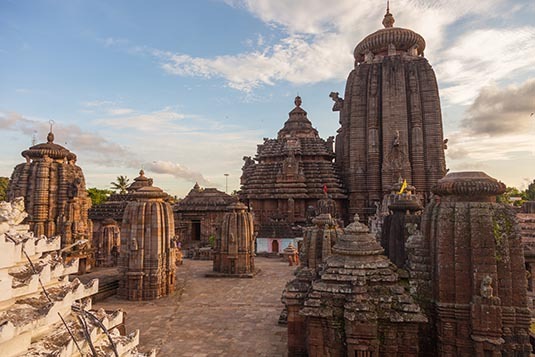 The temple represents the quintessence of the Kalinga Architecture and culminating the medieval stages of the architectural tradition at Bhubaneswar. 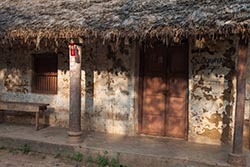 The temple is believed to be built by the kings from the Somavamsi dynasty, with later additions from the Ganga rulers. The temple is built in the Deula style that has four components, namely, vimana (structure containing the sanctum), jagamohana (assembly hall), natamandira (festival hall) and bhoga-mandapa (hall of offerings), each increasing in the height to its predecessor. The temple complex has 50 other shrines and is enclosed by a large compound wall. Photography is not permitted within the temple premises. As also non-Hindus are not allowed in. For the benefit of non-Hindu visitors, a viewing tower is built outside the temple compound. This is also a good place to take pictures. Feeling blessed, we left for Puri.